Hooray for Farmer’s Markets! Last year my parents joined the Cotton Mill Farmer’s Market in Carrollton, Ga as a way to get their products out to more people, and I must say that I love going out to say hello so I can browse all the lovely (local!) produce. It’s not a huge Market, but all the major food groups are represented: meats, dairy, fruits and veggies, and greens. There are some great people involved who really love their crafts, and it makes for a fun shopping experience when the farmer is clearly dying to tell you all about their products and methods. Buying local isn’t something that’s for everyone – sometimes it’s just not practical. The prices are higher than most conventional grocery stores; most Markets are open only one or two days a week, limiting your ability to get groceries at the drop of a hat; selection is limited to what’s in season, and there aren’t many exotic items (tahini in Georgia? I think not). But there are many advantages, chief of which is that the quality of the products is generally much higher. Because the produce isn’t being hauled from the other side of the continent, it’s usually perfectly ripe and ready to eat – and usually naturally grown or organic. 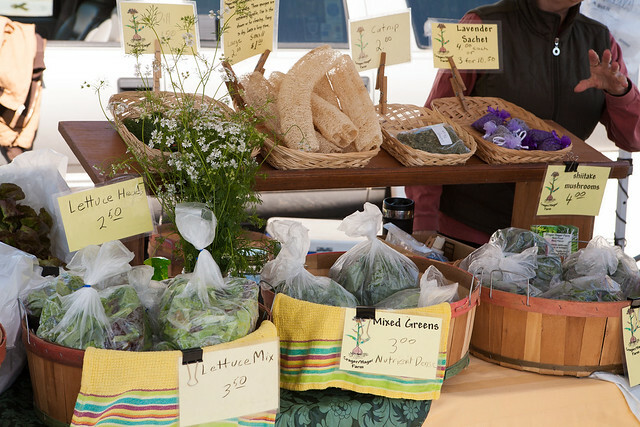 Also, buying from local farmers and artisans is a great way to put money back into your community. I’ll be honest here – I buy the majority of my groceries from Publix, but during the spring and summer I try to get as much of my produce as I can from the local producers. I like knowing that my food was grown less than an hour from where I live, and I like that it’s been grown by folks who have a love for farming. Because more people are becoming concerned about the quality of the food we eat, more and more Farmer’s Markets are popping up in cities and towns all across the country, and if you’ve never been to one, I encourage you to check one out. If nothing else, you’ll probably find a friendly farmer ready to talk your ear off about something. I can’t wait until produce starts coming in (especially peaches!)! I find that even if you have a garden, there is always an extra something tasty to be found there. Absolutely! I’m dying for peaches too, by the way… They are my favorite fruit, hands down, and I can’t wait for the first ones to show up! Strawberries are up there too. Can’t wait!